Below are links for news articles about the historic Idaho-Maryland mines, ranging from 1926 to 1957. These articles chronicle the discovery of rich veins, a worker strike, stock values, and the eventual closing of the mines. What is probably the biggest strike in recent years at the Idaho-Maryland mine was made yesterday when a party of four tributers struck a shoot of high grade ore in a drift from the 2000 level. Before the shift was completed they has recovered about 600 pounds of ore sufficiently valuable to require bank vault protection. Portions of the quartz, it was estimated, would run $4 to $5 per pound. The lucky four are M. McGuire, Guy Morez, Joe Merritt and Clarence Osborne, all Grass Valley district bred miners with long experience, some of them in the same mine at the time of its greater affluence. Associated with the four are eighteen other miners, the group going to work in the Idaho-Maryland some two months ago on a tribute basis. They were faced with an immense amount of preliminary work it being necessary to clear and repair an old drift nearly a mile in length. This work was undertaken and accomplished without a cent of pay and in the face of many discouragements. It was a week ago that the ledge was recovered and the work of breaking ground started. The men then divided into five groups, each taking a pitch to be worked on tribute. As it chanced the McGuire group was the first to make an important strike. The other four groups are expectant and hopeful. It was more than six months ago that Errol MacBoyle, the well known mining engineer, learning that the Whitney interests were about to abandon work at the Idaho-Maryland after the expenditure of $1,250,000 in efforts to rehabilitate the mine, secured an option to take over the property. Previously, according to current reports, several imminent engineers and geologists sent here has reported unfavorably on the property and pulling the pumps had virtually been decided upon. MacBoyle consulted with numerous old-time miners of this district and decide to experiment with the tributing system whereby numerous properties here were brought into production in former years. From the first good results have been apparent and the present strike, while natural not conclusive, goes a long way toward restoring confidence in the historic property. Albert Crase, who grew up with the Grass Valley mines, is superintendent and it was largely on the confidence expressed by him after many inspections that the present group decided to acquire property. Mr. Crase was injured in a flashlight explosion early this week while the ledge was being photographed. This fine discovery in the Idaho-Maryland, the result of the sound judgement of practical miners, will be good news to the entire community and is taken as a good augury of the long hoped for comeback of that once titanic mine. Cutting of the thousand foot payshoot of the Idaho-Maryland mine at the 1000 level was reported yesterday, the objective thus attained being regarded as of particular significance in connection with the future life of the property. Good ore was reported encountered in drifts from the upraise from the 1900 level. Mining men familiar with geologic conditions in that area interpreted the discovery as confirming the theory that the ledge in question extended to a point near the surface. The new and remarkable development of the Idaho-Maryland reverses the usual procedure in that it is from the bottom up. The ledge which forms the basis of rehabilitation was cut in drifts from the bottom of the old workings and has been opened by upraises on successive levels to the present 1000 foot level. Idaho-Maryland Consolidated Mines, Inc., one of the leading operators in the Grass Valley district, reports gross gold and silver recovered from 54,375 tons milled in 1931 totaled $752,656. Net production, after deducting bullion and smelter charges, was $741,311. E. L. Oliver, president, reports that total expenditures for the year were $401, 083, which included all development, overhead, compensation insurance, taxes, metallurgical experiments and cost of alterations and improvements of metallurgical plants. Net earnings, available for the $2,784 shares of $1 par value preferred and 1,701,932 shares of $1 par value common, totaled $340,227. Gross value of ore, including development ore milled, totaled $15.97 per ton. Total cost per ton milled was $7.38. During 1932 the company has increased its earning capacity through extensive development work on the 1,000 foot level. In addition high grade ore was found on the 2,000 foot level. It is reported that net earnings in January totaled $70,000 and since that time have been running between $10,000 and $50,000 monthly. By the end of 1931 the company had paid up accrued dividends on outstanding preferred stock and had retired 62 ½ per cent of the issue. Oliver reports that it is probable that current production will be ample to retire the balance of the preferred prior to the end of 1932 and leave ample working capital. The company now has no outstanding indebtedness and after the retirement of the preferred stock it is probable that dividends will be paid on common, Oliver said. Nearly 6,000 shares of Idaho-Maryland Mines Corporation common stock was traded over the San Francisco Curb Exchange during the last two days, with the stock showing the greatest strength of the year. On Friday, 1,000 shares moved at 5 ¾ and 5,300 at 6, with another 400 shares sold at 6 on Saturday. Early in the year the stock dropped to a low of $3.60. This followed the discovery that ore in the Borbestown property was far below expectation. As the company had made substantial investment in equipment and machinery at Forbestown, the disappointing showing depressed the shares. Much of the machinery was moved to the Brunswick property in the Grass Valley district, where, contrary to the Forbestown experience, ore of unexpectedly high value was found. As operation of the Brunswick shaft hitherto has been strictly a large-scale proposition – quantity handling of low-grade ore which would not be profitable except with the $35 gold price – discovery of the higher value speedily was reflected in earnings prospects. It also helped to offset the higher labor costs incurred by Idaho-Maryland in settling a labor dispute. GRASS VALLEY, June 25 – A witness in a National Relations Board hearing here today testified that gold worth $250,000 is stolen every year from mines of the Idaho-Maryland Mining Company. John F. Bongard the witness is a deputy State mineralogist and acted as an assistant to Federal operatives in recent investigations of violations of the national gold reserve act. He was called by the Idaho-Maryland Company to testify in the hearing before Patrick H. McNally, N. L. R. B. examiner, of miners’ charges the company closed down a mine because of union activity among workmen. Union miners, affiliated with John Lewis’ Committee for Industrial Organization, objected to introduction of Bongard’s testimony concerning highgrading of ore in the Mother Lode country. Errol MacBoyle, chairman of the State Mining Board, back from a month’s stay in Washington, draws a clouded picture of the capital of the United States of America in wartimes. For one thing, transient hotel accommodations are limited to five days. At the end of that time the guest is politely asked to vacate whether or not his business in the capital has been completed. As a matter of fact, he has probably only made the first dent in securing essential appointments. Mr. MacBoyle flew to Washington at the call of Representative Englebright to appear before the War Production Board, as the representative of Governor Olson, at the so-called hearing held just prior to the issuing of the drastic gold mines’ closing order. He reports having sensed from the beginning that the cards were well stacked against the gold mines, and, that, despite the seemingly friendly attitude of both Donald Nelson, the administrator, and Dr. Wilbur Nelson, director of the metals division. The result of the hearing has already been told in dispatched from Washington – how reliance was apparently placed in the labor statistics of 1940 instead of statistics freshly compiled by the gold mining interests from their own personnels. Proponents of the closing, which included General Frank McSherry, director of operations of the War Manpower Commission of the army, and Director McNutt of the Manpower Board, first claimed that 15,000 men would be released to strategic metals production. That figure, although soon reduced to 10,000 was sharply challenged by the mines’ representatives, who were prepared to prove that 2000 would be the top figure and that probably excessive. The obsolete 1940 statistics, however, apparently alone were given consideration; but the truth of the mine estimate is now admitted. At the request of Senator McCarran, Director McNutt, General McSherry, and Dr. Wilbur Nelson, representing Donald Nelson, appeared before a group of twenty western senators and discussed the tragedy of the arbitrary closing of the gold mines – the desolating of western communities. Later Senator Murray of Montana succeeded in presenting the producers’ side of the controversy direst to the President. Mr. Roosevelt said that while he was “sympathetic” he was unable to intervene and expressed the view that the closing was a necessity. After considerable delay, Englebright succeeded in getting an appointment with Administrator Donald Nelson. Mr. MacBoyle, who accompanied the representative, utilized the few minutes accorded him to state the blunt facts as they actually exist in every gold mining district – endangered mines, disrupted community life, faithful elderly employees turned adrift without living resources, negligible benefits to the strategic mines in the form of released labor. The administrator was visibly impressed and announced that he would ask Dr. Wilbur Nelson to gather all of the facts with the view of possible easements. Dr. Nelson, according to MacBoyle, is regarded as the most outstanding friend of the gold producers in official Washington, and the announcement of his selection as an arbiter was received with much satisfaction. Harry Payne Whitney’s Idaho-Maryland mine, situated, oddly enough, in Nevada County, Calif., was a worked-out property soon after the last war. Nevertheless, Errol MacBoyle, a mining engineer with the gold fever, believed that plenty of rich ore was left within easy reach of the old diggings. The gold vein had pinched out, he concluded, not because it was exhausted but because the earth had faulted, shoving the vein to one side and upward, perhaps not more than 50 feet away. The Pot of Gold: Whitney’s engineers listened. They hired MacBoyle. But on second thought they followed the advice of more conventional experts and tackled the problem in another way. They poured $2,225,000 into the mine before they finally gave up in 1925. MacBoyle determined to own that mine. He moved to Grass Valley to be near it. For the next seven years, his wife relates, they lived so frugally that “I didn’t know what it was to sit in anything but a straight-backed chair.” MacBoyle finally took over the mine, with a group of friends, virtually on a stack of promises, and incorporated it in 1935. When MacBoyle’s crosscut had penetrated a slow, painful 50 feet, his theory tottered. But success came 10 feet father on. The Idaho Maryland became one of the country’s large gold producers. In 1937 MacBoyle transferred his interest in the mine to the Grass Valley Memorial Hospital, as part of a scheme that revenue agents said was legal. Income from the 500,000 shares was allocated, 80 per cent to MacBoyle, until his selling price of $10 a share was paid, and 20 per cent to the hospital. Trustees were MacBoyle’s old friends and associates. 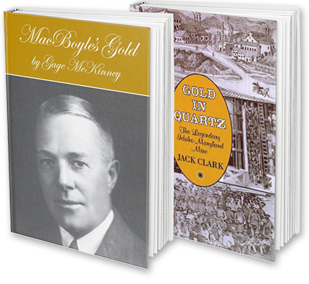 After the war stopped gold mining, MacBoyle demanded his money or his stock. His old friends said no; if the stock were returned, the revenue agents would move in and take it all. At last week’s meeting of Idaho Maryland stockholders, the hospital shares were voted against keeping MacBoyle on the board. He lost. However, of seven elected directors, the one receiving the highest vote was Mrs. MacBoyle, who had the support of MacBoyle’s minority faction. The directors proceeded to re-elect all officers, including MacBoyle as vice president. Developing work subsequent to the original report concerning the new gold bearing vein recently encountered at the Idaho-Maryland mine, has revealed the width to be 30 feet, according to a recent statement by Neil O’Donnell, general manager and executive vice president of the company. Four samples have been taken from two headings opened up on a cross cut. The first sample run $56 a ton. A second sample on the first heading scored $16. Samples ran $7 and $2.80 on the second heading. O’Donnell stated that while results to date are encouraging, it is still too early to determine whether the find is of real consequence. From the middle of the 1920 decade to the beginning of World War II two Union reporters made bi-monthly visits to the mines of the Grass Valley and Nevada City district in quest of firsthand news for the mining page which was then a feature of the newspaper. Occasionally, they traveled further afield, to Browns Valley, to Remington Hill, to Bear Valley’s Ziebright, to Wolf Creek’s Stockton Hill. Developments of news import were not always available save at one location, the historic Idaho-Maryland, then in process of consolidating such more or less inoperative properties as the Union Hill, the Brunswick and various others with the Idaho and Maryland locations. At the Idaho they were greeted by two astute mining figures, Errol MacBoyle, who had stepped into the breach when the fate of the once great producer of the Colemans was imminent flooding and probably abandonment for all time, and Albert Crase, his general manager. It was exceptional when some important piece of mining news was not available. The book, The Northern Mines, accredits Errol MacBoyle with appearing on the scene after the Whitney interests, discouraged by three or four years of failure to find the easterly extension of the Midas Idaho Lode in Maryland ground after its exhaustion near the Idaho end line, had given orders for that dirge of gold mines everywhere . . . “pull the pumps!” On the strength of a small stock interest, MacBoyle made a cursory examination of the workings and applied to the owners for an option. This being granted explorations were started which led to the recovery of the perhaps faulted lode. But the MacBoyle management was inclined to discount any unusual mineralogical perception. It said it merely went a little further. It was disclosed that the Dorsey management (prior owners of the Maryland claim) had penetrated to within a few feet of the lode. The Fulton (Whitney) management had actually cut into the wall at one point, but failed to recognize its importance. Back of that strike lay $30,000,000 in gold, and the end is not yet. The brilliant career of Errol MacBoyle was shadowed by six years of severe invalidism preceding his death last week. But in the history of gold mining in the United States there are few more dramatic incidents than his eleventh hour recovery of a gold-bearing lode of importance and value running into the tens of millions of dollars. Unlike many other operators who found wealth in the Grass Valley-Nevada City district, Errol MacBoyle did not transfer his residence to some city are of aristocratic note. Instead, through health and invalidism, he continued his home at Loma Rica, near the scene of his outstanding success, and it was in Grass Valley that he died and is buried. Idaho-Maryland Mines Corporation has completed a large raise from the 3,280-foor Brunswick level to the Idaho 2,700-foot level which it is hoped, will triple production at that part of the company’s Grass Valley property, E. L. Oliver, president, said yesterday. A raise, Oliver explained, is an upward excavation from a crosscut which serves as a chute by which ore can be dumped from a level to the one below. It is also used in underground exploring. About a year ago, the company made a new large ore discovery on the 2,700-foot level of the Idaho shaft, and has been developing it ever since. Oliver said completion of the raise will greatly increase operating efficiency inasmuch as ore extracted from the 2,700-foot level in the Idaho can now be more easily brought to the surface than heretofore. The raise will also solve the mine’s ventilation problem, he added. Idaho-Maryland’s present working force of three hundred men is averaging 18,000 tons of ore a month or approximately 500 tons a day. Capacity is 1,000 tons a day, Oliver pointed out. SAN FRANCICSO, Feb. 9 – Idaho Maryland Mines Corp. today estimated it operated at a net loss of $15,000 last year against loss of $83,823 in 1948. F. L. Oliver, president, reported that two new ore veins “of considerable potential value” were discovered by diamond drilling in 1949. It will require several months, he added, before the veins can be opened so average values may be estimated. GRASS VALLEY, May 20 (Exclusive) – White quartz glistening with free gold is being mined from the ore body discovered about three weeks ago on the 2700-foot level of the Idaho mine. Albert Crase, president and general manager of Idaho-Maryland Mines Corp., reported leasers have taken out $50,000 in specimen ore from one of the six parallel veins found in the zone, piling the high-grade in powder boxes as it is mined. Prospects are said excellent for production of some of the richest ore ever found in the Grass Valley area. The discovery was made in a zone between the 2300-foot workings of the Idaho and 3200-foot Brunswick mine level, in a virgin area opened by the wide raise or inside shaft completed about a year ago. A crosscut from the deep Brunswick level is being driven into the Idaho to contact the downward extension of the ore body and explore extensions of numerous intervening ledges. Crase expressed the belief that gold production from the new area will equal that of the 1928 discovery which made Idaho-Maryland Mines the second largest American gold producer. Specimen ore is showing in the new winze going down through the ore body from Idaho workings to the Brunswick 3200-foot level, and sufficient tonnage has already been blocked out to assure a long period of steady production. Idaho-Maryland owns about 3000 acres in the heart of the Grass Valley gold area, one of the richest producers in the world for 100 years. The original Idaho claim was first worked in 1851 and the property was a large producer between 1880 and 1895. The adjoining Brunswick mine was acquired some 20 years ago by the company and is a consistent producer of milling-grade ore.
GRASS VALLEY, May 4 – Discovery of a new gold ore body which he said will assure 15 to 20 years of productive operations was announced today by Albert Crase, president of the Idaho Maryland Mines Corp. The discovery was made in an area heretofore unexplored. It consists of six parallel veins dipping through a zone lying between the 2300-foot level and the bottom of the Brunswick mine. Crase expressed the belief that the new area blocked out will equal the discovery of 1928, which made the company the second largest gold producer in the country. Free gold has been showing in the winze, or connection, being driven between the Idaho mine through the new ore body, Crase said. Lessers working on a continuation of one of the six parallel veins, he said, had taken out $50,000 in specimen gold in powder boxes in the last month or two. Idaho-Maryland owns about 3000 acres on the Mother Lode in the Grass Valley district. The oldest property has been worked since 1851. John Sutter, baron of the vast Sacramento Valley, reached for the brandy decanter with a trembling hand. The news James Marshall had brought him this January night in 1848 came as a shock. Marshall had been building a sawmill for Sutter on the American River. He observed a few flakes of gold on the bedrock of the tailrace, and hurried back to Sutter’s sprawling fort and trading post at Sacramento to convey the news. Sutter knew the consequences. During the 1840s his fort had been the supply center of the western frontier. His vast herds furnished the settlers with beef while his mills supplied flour and lumber. News of the gold strike would send his own workers stampeding in search of the yellow metal, while strangers would swarm across the lands he had developed. Marshall’s discovery was soon known throughout the nation. Gold seekers came by the thousands, trampling Sutter’s crops and killing his cattle. He was pushed ruthlessly aside and his empire collapsed. Today Sutter would derive some measure of satisfaction in knowing that the industry he opposed is now engaged in a downhill battle for survival. Mine operators, who are sitting on top of a treasure which would have astounded the Spanish plunderers of Mexico, are going broke. Prior to Worl War II, there were 1600 gold mines in California. By 1953, 98% of the State’s output was coming from 10 mines, and today these mines are closing one by one. The miners, faced with rising costs, can no longer economically afford to extract gold from the earth at the rate of $35 an ounce established by the government in 1934. By law, the gold mined in the United States must be sold to the Treasury at a fixed rate. At Grass Valley, on the northern fringe of the Sierra Nevada’s famed Mother Lode, Jack Clark, superintendent of the Idaho Maryland Mine, surveyed a deserted shaft. Increased costs of labor, steel, blasting powder and lumber used for shoring have been instrumental in bringing gold mining operations to a standstill, while a fortune in the precious metal still remains beneath the earth. “We’ll have to let the mine flood itself,” Clark explained. “We’re down 2000 feet and you can divide that off in 140-foot levels where we can follow the veins of the ore. You’ve got to be taking gold out of the ground to afford to keep your pumping going. At the nearby Empire Star Mines Co. in Grass Valley, Hopkins R. Fitzpatrick, general manager of the concern, awaits reports from his few remaining workers who were struggling thousands of feet underground to dismantle valuable equipment before floodwaters submerged it. The North Star portion of the Empire Star Mine is 11,008 feet deep, the Empire section 8050 feet, and an adjacent shaft, the Pennsylvania mine, reaches a depth of 5100 feet. In July a strike brought all activity to a halt. L. L. Huelsdonk, secretary-treasurer and general manager of the Best Mines Co., examined a discouraging report on his firm’s Brush Creek Mine at Downieville. “In order to maintain an operation at all, we have been forced to select our ore and take only those higher grade portions which will pay us to mill,” he pointed out. “In doing this we have to leave our marginal ores behind to the detriment of our ore reserves. During our operation over the last several years, we have been depleting these ore reserves to an estimated amount of 90%. Even with a 100% increase in the price of gold ore, this lost ore could never be recovered. In recent years the Best Mines Co. abandoned work on three other mines. “We have also been compelled to sell the Ruby Mine from which we mined the finest collection of placer gold in the world,” Huelsdonk added. Donald H. McLaughlin, president of the Homestake Mining Co., San Francisco, and considered one of the country’s leading authorities on gold, has some interesting observations on the plight of his industry. The Homestake Mine his company operates in the Black Hills of South Dakota is the largest in the United States, with an annual output of $20,000,000 in gold. “Gold is now grossly undervalued in terms of the already depreciated paper dollar,” he declared. “Foreign holders of dollars can convert them into gold through Central Banks abroad, but this privilege is denied the American citizens who are still not allowed to own gold except under many restrictions. “The gold miner is in a particularly difficult position, for he must accept paper dollars for his gold at a rate set in 1934, and yet is denied the protection against inflation that his gold could give if he and other citizens could own and retain it. He must meet his payroll and buy his supplies with the paper dollars he receives and each year they buy less and less. McLaughlin advocates a restoration of the gold standard, with the dollar and gold freely convertible at a ratio that would be determined by the present purchasing power of the dollar and the stable value of gold. This would mean a much higher price for gold – probably not less than $70 per ounce. Huelsdonk is a member of the State Mining Board. He has just returned from an extensive trip to Europe, where he talked to leading bankers in France, England, Switzerland, Italy, Spain and other countries. “The European bankers have built up a solid wall against any official increase in the price of gold,” he said. “They are all agreed that the United States is holding the price down and must do so as a responsibility to the rest of the world in order that monetary management and balance of payments will not be upset. Their reasoning is that increasing the price would be inflationary. Huelsdonk is in favor of a government subsidy as the only solution to the problems which face the mining industry today. “I am wholly convinced that it could be almost wholly financed through a tax levied on the industrial gold sold from our monetary stock. Let me explain. Industrial gold is that metal which is used in the fashioning of jewelry, electronics and for many other purposes in manufacturing. The dental profession uses a considerable amount,” he said. “Prior to Worl War II, the amount of gold required for industrial use was less than $1,000,000. During the war this required amount steadily rose to amounts above $100,000,000 annually, and was issued through special licenses to the industrial users for $35 per ounce minus ¼ % handling charge. “This same gold was supplied to the Treasury Department by the gold operators under law for $35 an ounce, less the handling charge. Once this gold is obtained by the industrial users, the increased price for its sale is not regulated and the industrial user is able to multiply his profit many times. The gold miners want the restrictions on the purchase, ownership and sale of gold by United States citizens to be abolished. They would encourage use of gold coins once more, pointing out that although Americans cannot buy gold in their own country, they can legally buy and hold it in many foreign countries. In Grass Valley, a veteran miner gazed at the rusting equipment of a deserted shaft and shook his head sadly.